On Dec. 23rd, 2015, 11 year old Rattles was frightened by neighborhood gunshots and dug out from his kennel. We didn’t notice he was missing until after dark around 6:30pm. The whether was crappy and was sleeting. Ilana did a quick look and call for him on our inside-dog walkies loop, but Rattles wasn’t around. The next morning, Rattles was still not home. 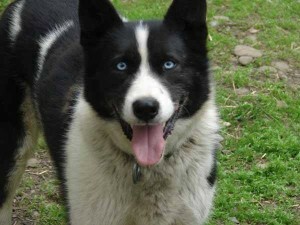 It’s unusual for a dog to not come home, but it has happened before, and has happened to Rattles. On April 3rd, 2008 Rattles climbed the fence in Fairbanks and was found three days later in a trap. We were very concerned, especially since we just moved to L’Amable in July 2015 and Rattles has never been on the trails. We began walking the trails looking for him and putting up signs on the extensive snowmobile trail system. Unfortunately, there wasn’t any snow (until Monday the 28th) and we didn’t see a soul on the trail system. On the morning of Tuesday Dec. 29, we received a call at 7:15am from a woman who said she saw Rattles in her yard on in Gilmour Highway 62 S. on Sunday Dec. 27. We drove out to Trudy’s, the Gilmour gas/liquor store, and the shopkeeper said she too saw Rattles on the same day the other woman spotted him (Dec. 27th). That was two days ago! He could be anywhere. We put up more signs in the Gilmour area, and on Dec. 29 we took a team of 10 dogs on our first ever mush in L’Amable to the Hastings Heritage trail. The idea was to set a scented trail for Rattles in case he was headed back in our direction. On Wed. Dec. 30, Ilana skiied from Trudy’s to Upper Turiff road, and didn’t see any sign of Rattles. On Dec. 31 at 10:00am we received a phone call from someone who asked if we were missing a black and white dog. The woman said they pulled the dog from the lake and wasn’t sure he was going to make it. They would meet me at Steenburg Lake Rd. S. and drive me into the location where the Rat was found. I probably don’t have the story exactly right, but Lisa, Vince, and Bill were working at a construction site. They weren’t even going to work this week, but happened to be out there. Bill (or Vince) went out for a pee and heard barking. He saw Rattles in the lake! Apparently, Rattles walked onto thin ice (the lakes are NOT frozen at all) and fell in. They tried calling to him but he almost swam to the other dock. Lisa came out and called him and he responded. Somehow they go onto the thin ice themselves and dragged him out. When they got him out and brought him inside he was stiff and collapsed. They thought he was dead. They pounded his chest and put warm towels and shirts on him and put him next to the heater. They were treating him for hypothermia. When I got there, he was somewhat alert. He was able to raise his head but his legs were all floppy. I called the only vet in town and explained the situation, Rattles was gone for 8 days and was found in a lake, could they see him. The doctor working that day, doctor Rajeep Multani, said they were too busy and couldn’t see Rattles. Additionally, I wasn’t referred to another clinic. We let Rattles warm up and stop shivering. He ate a peanut butter sandwich while he warmed up. Vince carried him to the car and I drove him home. Since he’s been home he’s eaten and drank a little and is resting. 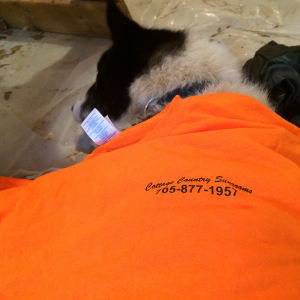 We are so thankful to Lisa, Vince, and Bill, who work for Cottage Country Sunrooms, for saving our dog! 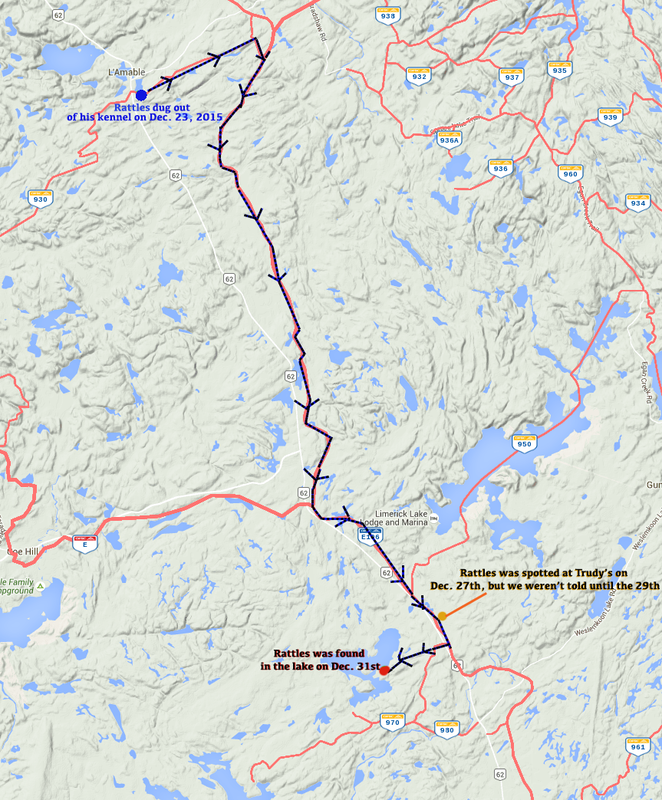 We think the route he took is the one below (the blue lines– the red lines are the snowmobile trails), but aren’t 100% sure of his route. I’m sure he has some stories to tell. Next Next post: Happy New Year 2016. First mush of the year! It’s quite possible that Rattles followed the Old Hastings Road down to St Ola. So happy that he made it home. If only they could talk. Welcome to the L’Amable neighbourhood! We see you going by our place on the trail (on Bessemer trail with the big white garage and green jeep).